It’s Black Friday & Cyber Monday deal time! I have been working like one of Santa’s elves digging up all these great Black Friday deals for homeschoolers. I will be adding to this post throughout the weekend as more sales become public so check back often. Leave me a comment if you find one I should add and share with your friends! Updated 12 p.m. Monday Nov. 26. Check store websites for official details. Reminder: Some of these links are affiliate links. Ok…so this is more for you than for them, but it is a great price on Circle by Disney home Internet control. Read more about Circle by Disney here. This tablet comes with a “If they break it, we’ll replace it. No questions asked” 2-year guarantee. This tablet is a good option for reading online books, listening to audible books and playing educational games (with limits!) and submitting typed responses for your schooling. Durable and comes with a free year of Amazon Free Time. The Kids Echo 3 Pack is on sale for just $99 [save $110]. This handy gadget is on our Gift Guide for Kids. 50% off Gift Book and Collectible Editions: Customers can receive 50% off gift books and collectible editions. Harry Potter Gift with Purchase: Receive a set of four exclusive Harry Potter Minifigures with any LEGO® purchase of $75 or more, while supplies last. 10% off site wide through Nov. 26 with code “thankyou” including this lovely new edition of the classic Charlotte Mason volumes. I think I need those on my shelf! Thousands of courses are just $9.99 through Monday at Udemy.com. Learn everything from watercolors to white hat hacking. 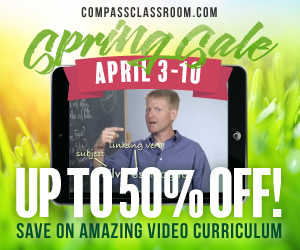 Compass Classroom makes video curriculum that’s fun for kids, smart for moms, and easy for everyone. They are celebrating fall with awesome deals on most titles. Perfect for a fresh start next term. We have used the Visual Latin program and look forward to using some history programs in high school. Seeds Family Worship is offering BOGO deals on all their albums of hymns and worship music. The Great Courses is offering free shipping. Usually more than $100 there are 45 titles for $40 and under available through 12/28. ChristianBook.Com has some wonderful Cyber Monday deals on Bibles, books, toys and games through 12/3. Cyber Monday sale offers 30% off all BraveWriter products for 1 day only. Sale starts on Monday November 26 9:00 AM (Eastern) and ends 9:00 AM (Eastern) on Tuesday November 27. Some of the best toys anywhere including many that are exclusive to this site. We love Perplexus, but Ribbon Ninja and The OffBits look pretty cool too! Get $25 on any $150 purchase here and flat rate $3.99 shipping in the US. Get 6 months of language learning free with an 24 month subscription. Other deals are also offered on a variety of programs in multiple languages such as 3 months for $50.97 (reg. $79). Magic Cabin has the cutest things for imaginative play such as beautiful wearable dragon wings, giant play forts, snuggly woodland creature sleeping bags and much more. Get 15% off plus free shipping on $49+ with code CHEER15 through Dec. 8. Hundreds of low-cost classics and activity books to choose from make great stocking stuffers. Top titles are 40% off with orders of $30 or more using code CYBR6. Good today only–Nov. 26. Bright Ideas Press (i.e. Mystery of History, North Star Geography, Christian Kids Explore Science and other great titles) is offering 20% off through Nov. 26. This beautiful Charlotte Mason inspired curriculum is on sale for 30% off through Nov. 26 with code FINAL2018. Get the best price on their upcoming weekend retreat featuring Sonya Shafer, Richele Baburina and Allyson Adrian. This weekend only just $169 (Reg. $249). Brandy’s Afterthoughts blog is one of my absolutely favorites. This weekend she is offering 20% off anything in her shop including audio recordings and Start Here, a guide through Charlotte Mason’s 20 principles. Use coupon code santa20 through Monday. Maestro Classics CDs with Activity Books are just $9.98 with FREE SHIPPING. Their Nutcracker and Classic Composer bundles are also on sale. These sets are a great way to expose children to the beauty and history of famous musical works.